A New York police officer visits a memorial on Christmas Day, at the site where two officers were killed in the Bedford-Stuyvesant neighborhood in Brooklyn. They stood, in tears, or crouched in silence, or stared solemnly on a Brooklyn street corner before a pile of bouquets, Christmas wreaths, teddy bears and candles snuffed out by the December wind. One after another — police officers, detectives, sergeants and lieutenants — arrived here to pay respects to two of their own who were ambushed and killed last week at this spot, now a shrine to the fallen men. On Thursday afternoon, the uniformed officers were joined by New Yorkers, visitors from out of town and dozens of members of the clergy who made the intersection of Myrtle and Tompkins Avenues in the Bedford-Stuyvesant neighborhood part of their holiday observance. Left behind at home were family suppers and presents under trees. Christmas Day, some of those gathered said, was better spent here, honoring the two men. Still wearing colorful face paint from a Christmas carnival they had just visited, eight members of a far-flung extended family from North Carolina and Washington stood beside a tent erected above the candles. They said the memorial was an essential stop, just after church. In the midst of stuffed animals and flowers were two dwarf Christmas trees. They seemed to almost evoke the officers, Wenjian Liu and Rafael Ramos, who were killed as they sat in their squad car by Ismaaiyl Brinsley, who later shot himself on a nearby subway platform. Around 1 p.m., a cluster of uniformed officers arrived. A shout went up from some of the clergy who were still milling about: “A prayer to protect the police!” They flocked around the officers and, in a semicircle, stood facing them. In the thin winter light, the ministers began to pray in Spanish, their voices rising with fervor. Their hands stretched above their heads, reaching out over the officers, who stood silently facing the crowd. 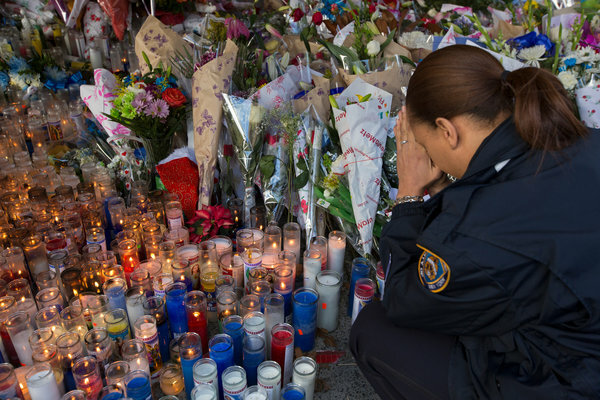 As the prayers echoed across Tompkins Avenue, one police officer closed his eyes.